Antimicrobial Resistance (AMR) is a serious problem for the humans since it threatens the effective prevention and treatment of an ever-increasing range of infections caused by bacteria, parasites, viruses and fungi. One way around this problem is to act on the virulence factors, produced by bacteria, which increase their infection effectiveness. In view of these facts, new coumarin derivatives were synthesized and evaluated for their anti-virulence biological activity towards Pseudomonas aeruginosa. The results suggest that coumarin derivatives with a secondary carbon at C-3 position reduces P. aeruginosa growth whereas compounds with one additional substituent have a significant effect over pyocyanin production (10k EC50 7 ± 2 µM; 10l EC50 42 ± 13 µM). Moreover, 10k reduces P. aeruginosa motility and biofilm formation, what is compatible with a quorum sensing related mechanism of action. Keywords: Antimicrobial resistance, anti-virulence, cellular assay, phenazine, 2H-chromen-2-one, inhibitor. Keywords:Antimicrobial resistance, anti-virulence, cellular assay, phenazine, 2H-chromen-2-one, inhibitor. Abstract:Antimicrobial Resistance (AMR) is a serious problem for the humans since it threatens the effective prevention and treatment of an ever-increasing range of infections caused by bacteria, parasites, viruses and fungi. One way around this problem is to act on the virulence factors, produced by bacteria, which increase their infection effectiveness. In view of these facts, new coumarin derivatives were synthesized and evaluated for their anti-virulence biological activity towards Pseudomonas aeruginosa. 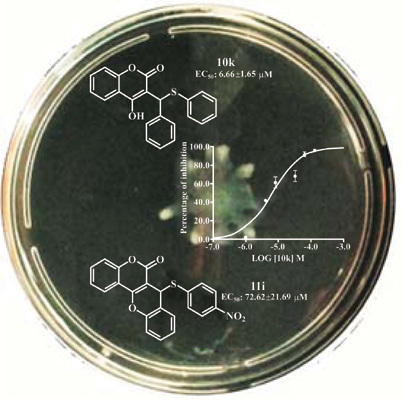 The results suggest that coumarin derivatives with a secondary carbon at C-3 position reduces P. aeruginosa growth whereas compounds with one additional substituent have a significant effect over pyocyanin production (10k EC50 7 ± 2 µM; 10l EC50 42 ± 13 µM). Moreover, 10k reduces P. aeruginosa motility and biofilm formation, what is compatible with a quorum sensing related mechanism of action.